I think it's a god card. Possible to apply to an opponent's minion. Never tried to windfury minion, I wonder the result for now. Not always but good synergy with Spikeridged Steed. Double Spikeridged and Double Blessing of Wisdom to one friendly minion in increasing turn. Its synergy is great. 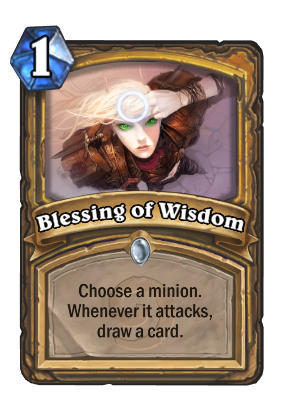 I always put 2 Blessing of Wisdom in my Paladin deck. 1 mana. Give a minion soft taunt/"Kill-me flag". Draw a card. This can be an extremely powerful card. At worst, it's a 1 mana cycle, but if you play it intelligently you can get multiple draws, and your chances of winning a close game go way up. I'm getting a lot of mileage out of it in my Pallygon deck. Also, when you cast Blessing of Wisdom on a monster and your opponent takes over the monster (with i.e. Shadow Madness) YOU draw a card when he attacks with it, not your opponent.